Much of January has been cold and stagnant. Not many storms coming over the mountains, and the snow has not been good for skiing. With all the ice fog, it’s been easy to stay home and do other things–like stay warm, write, paint, cook, read, piece quilts. The last few days have brought a welcome change of weather. A person can look out the window to see snow, rain, blue sky. The inside of the house feels stale and claustrophobic. This afternoon I put skis as well as snowshoes in the back of the truck and headed out. If the snow was too horrible to ski on, I could always snowshoe. Most of the time I would rather glide on skis than trudge on snowshoes. Today I was in luck. A light snow was falling as I made my way up the Jungle Creek road. The metal edges of the skis sliced and scraped against the crusty side of the track, and the fish scales on the bottoms whizzed over icy spots. I had overdressed, so pulled off a layer and opened the vents in my pants and coat. My breathing smoothed into a slow steady rhythm. The creek is overhung with snowbanks, with plates of ice piled up against the sides. 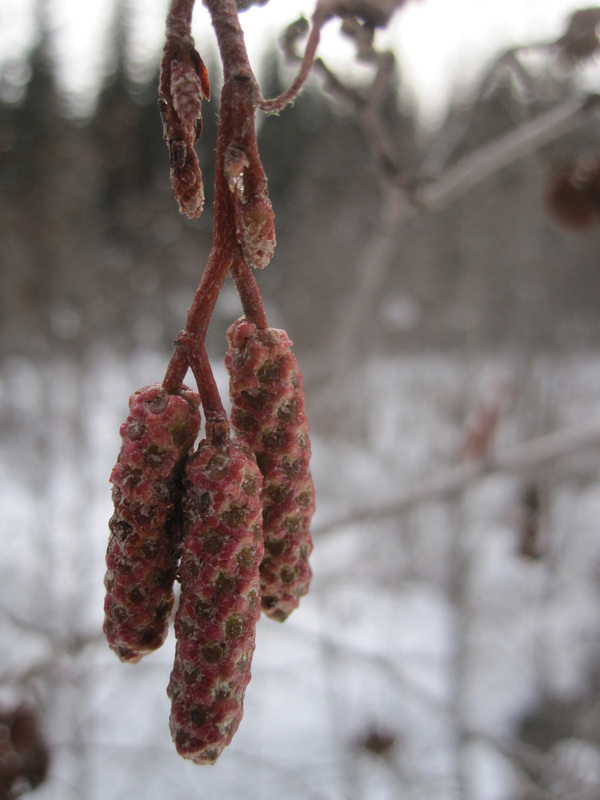 I stopped to look closely at these alder catkins. When they open in spring, yellow pollen spews out. I’ve always called this plant sitka alder. Of the eight alder species in North America, only four of them take the form of a tree. The others are shrubs. Sitka alder is a robust shrub that prefers moist areas and creek banks. It can be found growing in avalanche paths. Fast-growing, it loves sun but will tolerate some shade. It’s a pioneer plant, coming in after ground-disturbance. All of the alders are capable of fixing nitrogen from the atmosphere into the soil where it can be used by other plants, so it has ecological value. As a trail crew member, I have slaughtered and maimed many alder bushes in order to clear the trail. Sometimes it feels like we’re committing vegetation mayhem, but it always grows back. Sitka alder seems to be in a taxonomic limbo right now. I looked up the scientific name, only to find several options: Alnus sinuata; Alnus crispa spp. sinuata; Alnus sitchensis; Alnus viridis spp. sinuata. All of these names refer to the same plant, and I’m not sure why there are so many choices. I didn’t know this while I was skiing–only that the catkins are lengthening even as some of the branches are held down by snow. I saw sticky buds on cottonwoods as well. It’s still winter, but there is a glimmering possibility of the next season’s approach. The days are noticeably longer.